You need to send an important update or invitation to all your clients and you're ready to hit the "send" key. Don't! If your eMail hosting provider or Internet Service Provider sees a lot of mail coming from you that looks the same, this will be categorized as "bulk" commercial mail and you may unwittingly violate the acceptable use policy of your provider. Even though these would be emails people want, the systems and algorithms in place can't tell the difference between your well-crafted invitation to a high-quality event, or highly thoughtful customer update, and the massive amount of spam on the Internet. To send bulk mail, first you must comply with the current anti-spam laws, and then you need to find a way to successfully deliver your mail. The email contains a valid, physical postal address for the sender. Source: Cornell Law School: Legal Information Institute. Even if you follow all these rules, now you need to find a way to deliver your mail to your recipients. Your email hosting provider or Internet Service Provider will not be reviewing the contents of the email so they may just block you. If you plan to use any bulk email, we recommend Constant Contact or Hubspot to send your mail. There are also many other excellent providers, but these are the ones we use and recommend. We've seen clients try to work around the bulk mail limitations by sending mail in batches or by trying to hide the number of recipients in distribution lists. It won't work! Computer systems are very good at recognizing patterns and you won't outsmart the system. Blocking an individual sender, which is highly inconvenient for that sender, actually protects you from the worse situation of having your entire domain blocked. If your domain is blacklisted, it will take time to get off the black list, and in the meanwhile, no one in your company will be able to send email. Why do eMail hosts and Internet Service Providers block mail? They're trying to cut down on the spam that ties up about 90% of email traffic. 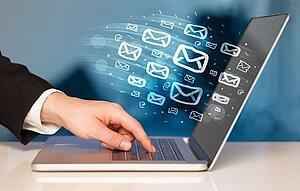 Many viruses attack PCs by turning them into "zombies" that send mail on behalf of spammers. This ties up valuable resources, so the hosts and Internet Service providers want to stop it... and unfortunately they wind up stopping the "good guys". After you comply with all the rules, and use the right platform, keep in mind that if customers "unsubscribe" then you can't add them back on to the list. We recently sent out an important customer update, and found that a few customers didn't receive it because they had unsubscribed from our newsletter. Focus on high value information, and use your bulk mail sparingly to keep the retention level high. You may also need to do some customer education around what you're trying to achieve with the notifications so they won't just de-clutter one day and cut off all communications (and then ask why they didn't get the important update). Bottom line, don't fool around with bulk mail. eMail is a great way to get the attention of your clients directly in their inbox, but be informed and responsible before hitting that "send" button!